Toyota's "DJ Robot," a two-wheeled android belonging to a band of robot musicians that entertained visitors at the 2005 Aichi World Expo, has ditched its entertainment career for a job as a receptionist. DJ Robot's departure from the band comes as Toyota gears up for its debut of a new robot violinist this autumn. 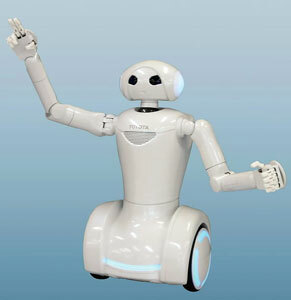 Since the Expo, the 1-meter tall DJ Robot, which rolls around on a pair of Segway-like wheels, has been working to improve its ability to interact and communicate with humans. As a receptionist, the machine will use these skills to provide information, answer questions and show visitors around offices and exhibitions. DJ Robot's first gig will come at the end of August when it goes to work alongside human receptionists at the Toyota Kaikan Exhibition Hall at company headquarters in Toyota City, which sees more than 400,000 visitors per year. 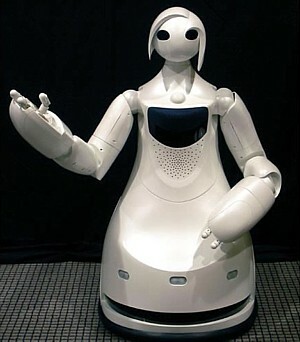 In January 2008, the droid will begin working at Toyota's Nagoya office on the 24th floor of Midland Square, an office and shopping complex at Nagoya station, while additional versions of the robot will be rolled out at other company facilities at later dates. Toyota has yet to announce whether DJ Robot will be changing its name to better suit its new role as receptionist. With its move into the robo-receptionist industry, DJ Robot clearly follows in the footsteps (and wheel tracks) of Honda's Asimo and Mitsubishi's Wakamaru, both of which have tasted some degree of success. While DJ Robot lags behind the competition in terms of experience, Toyota is confident its control technology will enable the bot to respond quickly and operate smoothly in its new environment. For now, Toyota plans to keep the robot employed at its own facilities, and there are no plans to put any models up for sale or rent. Interestingly, DJ Robot's departure from the entertainment world comes as Toyota prepares to debut a new android that can walk around and play violin like a human. Toyota worked long and hard to develop robot hands capable of playing the violin. In particular, the robot's left hand requires precise fingers that can press the strings properly, while the right hand needs to constantly adjust the amount of force used when holding and drawing the bow across the strings. According to Toyota, the advanced technology at work in these hands could eventually be put to use in humanoid robots that provide nursing care. In other words, whenever this robo-violinist retires, we can probably expect to see it get a job at a hospital. The violinist will hook up with Toyota's other droid musicians to form a "robot orchestra," which is scheduled to hold its debut performance this autumn as part of Toyota's 70th anniversary celebration. The Robot Museum, Japan's first museum fully dedicated to educating visitors about the robots of the world, is scheduled to open in Nagoya's Sakae district in October, according to a June 29 announcement by Osaka-based robot venture GYROWALK and Osaka-based real estate auction services provider IDU. 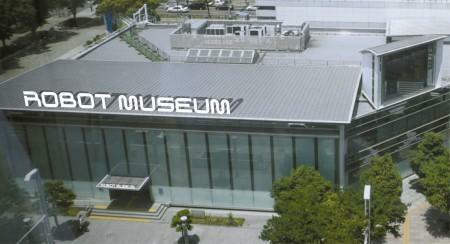 Housed in a refurbished building that used to serve as an imported car showroom, the 2,600 square meter museum will center around an exhibition area entitled "Robothink," where everything from toy robots to industrial robots will be showcased in exhibits covering topics from robot history to the latest in robot technology. Some of the robots that enjoyed the limelight of the 2005 Aichi Expo, held just outside Nagoya, will be prominently featured. 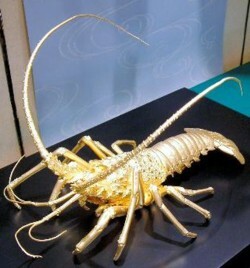 The entrance fee for the museum has yet to be determined.